Home Common Mistakes Who or Whom? Let’s Get Over With It! When it comes to common English mistakes, I think the ‘WHOM or WHO’ debate takes the no.1 position. Well, today we’ll try to overcome this battle, once and for all. The subject of a sentence is the person, place, thing, or idea that is either doing or being something. In a way, the doer of the verb in the sentence is called as the SUBJECT. OBJECT, on the other hand, is that entity of the sentence on which the work is being done. Thus, an object is the receiver of the subject’s actions. • Who should be used to refer to the subject of a sentence. • Whom should be used to refer to the object of a verb or preposition. 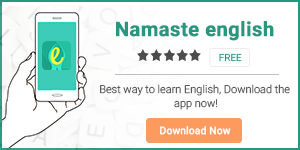 Let’s understand with the help of examples. Here, ‘made’ and ‘wrote’ are the verbs. We know that the doer of the verb is the subject. यहाँ यह स्पष्ट है कि सवाल ‘subject’ के बारे में है और इसलिए, हमने ‘who’ का इस्तेमाल किया? Here you see that we used the word ‘whom’ for the receiver of the action done by the subject of the sentence. If you are having trouble with all the rules and the subject-object blah blah (which I know that you are or else why would you look it up here? ), then there is one easy-peasy trick that might come handy. Correct Who made this cake? – He made this cake. Incorrect Whom made this cake? – Him made this cake. Correct Whom has she married? – She married him. Incorrect Who has she married? – She married he. 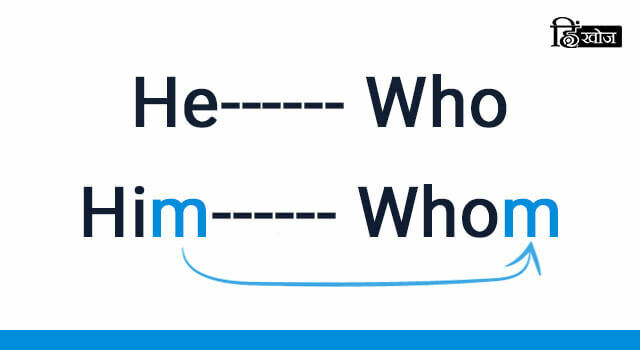 Like whom, the pronoun him ends with the letter M.
So, if you can answer the question with ‘hiM‘, then use ‘whoM‘, and it’s easy to remember as they both end with M.